Take the track/road east out of Suarias past cow trough on the right and up the mountain, then after ~500m turn left (near small quarry) and down for 200+m. A closed valley on the left (altitude ~305m) conceals the 5m high entrance to Cabañuca. The main/big depression containing the inpenetrable sink is on the right at this point. Description: Sink cave. VR 87m. Length 809m. Alt 305 m.
See OUCC Report 1975/1976 ». 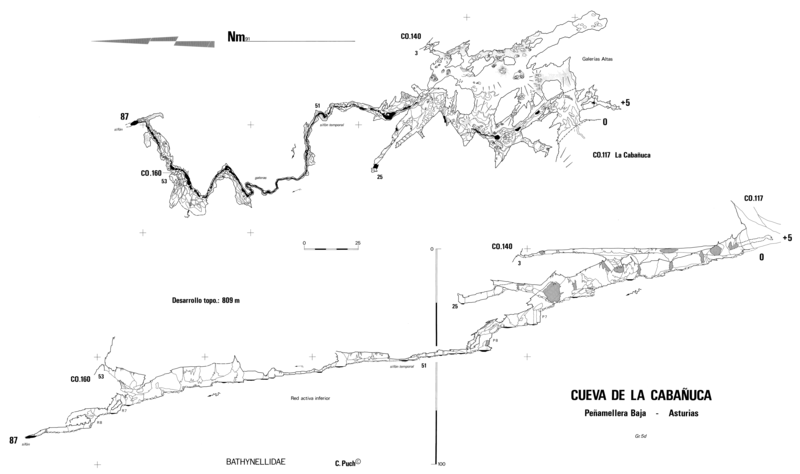 Also explored and surveyed by Carlos Puch and STD/Club Bathynellidae. 1982 – dry series, altitude measured but not recorded! This page was last edited on 2015-08-26 by mfc.